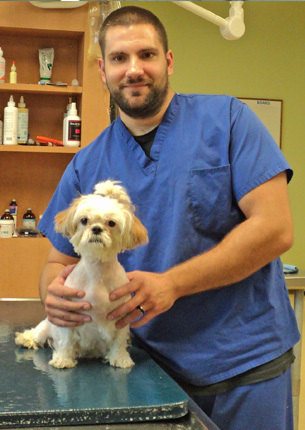 Michael Cortese joined the team at our animal hospital in April of 2015. His job responsibilities include drawing blood, vaccinating pets, assisting during surgeries, taking X-rays, and passing IV catheters. Michael has over 10 years' experience in animal-related positions, and he's quickly developed a reputation as a quick learner who's willing to do everything necessary to make a pet healthy. "It's a fun job working with different pets and meeting different people," Michael says. "I truly enjoy helping keep pets happy and healthy." At home Michael cares for a Spaniel mix named Jonny ("He's 13, but he acts like he's 2," Michael says.) In his free time he enjoys playing with his two children, going to the gym, and spending time with friends and family. 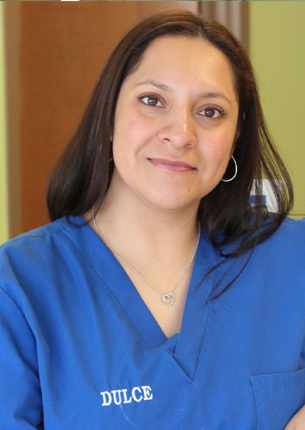 Since becoming a member of the team at Animal Hospital on Route 66 in August 2015, Myra Garcia has taken on a wide variety of responsibilities, including giving medications, shots or treatments, collecting and maintaining patient records, taking and developing X-rays, collecting and testing lab samples, giving animals nursing care and first aid, and preparing animals for exams and/or surgery. 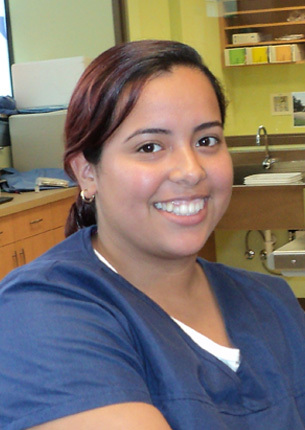 Myra's favorite part of her position is working in our animal hospital laboratory. Myra is a graduate of Fox College Institution of Veterinary Technology, where she earned her Associate's degree in Applied Science. She is also a certified veterinary technician. Myra is the proud pet parent to two dogs named Xylo and DeeDee, as well as four Guinea Pigs named Hercules, Medusa, Rutila, and Lil'G. When she's not at work, Myra enjoys relaxing with her dogs, camping, reading a book, or looking up funny videos. Juan Carlos began working at our animal hospital in July of 2015. 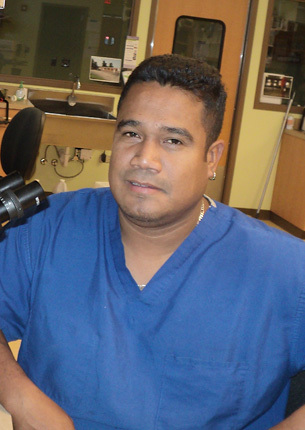 His duties include performing radiography and dental prophylaxis, but Juan Carlos most enjoys assisting in surgeries. Juan Carlos is a graduate of Fox College Institution of Veterinary Technology, where he earned his Associate's degree in Applied Science. He is also a certified veterinary technician. "I love working here because I get to help the pets of my local neighbors," Juan Carlos explains. In his free time Juan Carlos enjoys running, working out, skating, biking, hiking, swimming, dancing and finding new adventures. He also cares for four dogs: Chihuahuas named Bimbo and Fevie, a Pitbull named Diesel, and a Husky named Diamond. Dulce Tellez has worked with Dr. Perez since October of 2002, and she officially joined the staff of our animal hospital in April of 2015. Since then, Dulce's responsibilities have included welcoming clients and managing their pets' records so they can be seen by the doctor. Her favorite part of the job is answering clients' questions so they feel confident their pet is receiving the best possible care. "I love the family-like atmosphere here," Dulce explains. "We all respect each other, which is a great thing. We have fun working with each other every day!" At home, Dulce cares for a Spaniel mix named Jonny. In her free time she enjoys taking her children to outdoor activities such as the beach, the playground, and the park. 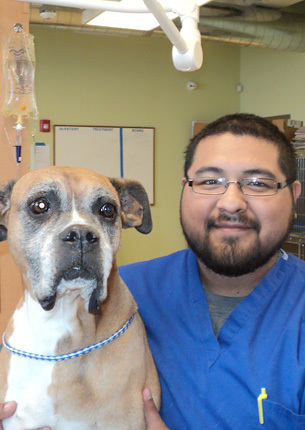 Veterinary Assistant Felipe Lascurain has worked at Dr. Perez's Brighton Park Animal Hospital since it opened in 2001. He joined the team at Animal Hospital on Route 66 as a part-time employee in April 2015. "I love working here because I've grown with Dr. Perez," he says. "I started with him at his first clinic and having the opportunity to grow with him at his new hospital truly brings me joy." Felipe is responsible for administering vaccines, assisting during surgery, collecting samples for laboratory testing, taking X-rays, and inserting intravenous catheters. "Surgeries are my favorite part of the job, from beginning to end," he says. At home, Felipe has a five-year-old Boxer. Her Aztec name, Zyanya, means "forever." Felipe enjoys being outdoors in his free time. He especially likes windsurfing, sailing, and other water sports. 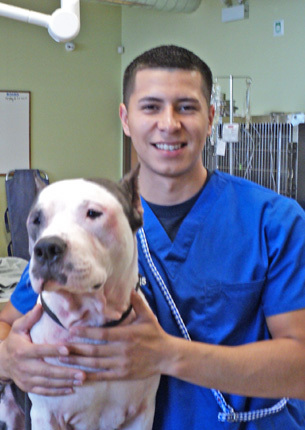 Veterinary Technician Adrian Perez got his start in veterinary care five years ago at Brighton Park Animal Hospital. He joined the Animal Hospital on Route 66 as a part-time employee in April 2010. "I work with some of my co-workers of (Brighton Park Animal Hospital)," he says. "There is more technology here at Route 66." Adrian is responsible for assisting our clients, administering vaccines, and making sure everything runs smoothly during appointments. He most enjoys the interactions with different clients each day, as well as caring for their pets. Adrian has learned all of his skills on-the-job and puts his best effort into his work. He is bilingual, which is an invaluable asset to our team. At home, Adrian enjoys spending time with his family - going to the zoo, museum, and aquarium together. He has a 12-year-old cat named Gizmo.